Community Data Science Workshops — The Community Data Science Workshops (CDSW) are a series of workshops designed to introduce some of the basic tools of programming and analysis of data from online communities to absolute beginners. The CDSW have been held four times in Seattle in 2014 and 2015. So far, more than 80 people have volunteered their weekends to teach more than 350 people to program in Python, to build datasets from Web APIs, and to ask and answer questions using these data. [Fall 2018] DATA512: Human Centered Data Science — A core course in the UW professional Master of Science in Data Science program covering a range of ethical and practical considerations in the practice of data science research and the design of algorithmically-driven applications taught by Jonathan T. Morgan. [Fall 2017] COM597: Innovation Communities — A UW Communication Leadership’s elective in the “Masters in Communication in Communities and Networks” program covering using online communities to harness user innovation taught by Benjamin Mako Hill. [Fall 2017] DATA512: Human Centered Data Science — Fundamental principles of data science and its human implications. Data ethics; data privacy; differential privacy; algorithmic bias; legal frameworks and intellectual property; provenance and reproducibility; data curation and preservation; user experience design and usability testing for big data; ethics of crowdwork; data communication; and societal impacts of data science. [Winter 2017] COM521: Statistics and Statistical Programming — A quarter-long quantitative methods course that builds a first-quarter introduction to quantitative methodology and that focuses on both the more mathematical elements of statistics as well as the nuts-and-bolts of statistical programming in the GNU R programming language. Taught by Benjamin Mako Hill. [Fall 2016] COM597A: Building Successful Online Communities — A quarter-long course taught by Benjamin Mako Hill on online communities and computer mediated communication with an emphasis on learning from research in social psychology, sociology, and behavioral economics. The course is taught in the University of Washington's Communication Leadership program. 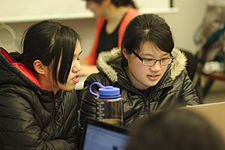 [Spring 2016] COM597: Programming and Data Science for Social Media — A quarter-long course taught by Tommy Guy that adapts and builds upon the CDSW curriculum to teach introductory programming and data science to absolute beginners in the context of the University of Washington's Communication Leadership program. [Spring 2016] HCDE598: Data Science for User Experience Researchers: A special topics course in the "Masters in Human Centered Design & Engineering" program covering the use of data science tools and concepts to conduct research with open online data taught by Jonathan Morgan. [Spring 2016] COM597F: Innovation Communities — A UW Communication Leadership’s elective in the “Masters in Communication in Communities and Networks” program covering using online communities to harness user innovation taught by Benjamin Mako Hill. [Spring 2016] COM528: Internet Research Methods — A MA/PhD class offering a survey of several Internet research methods taught by Benjamin Mako Hill. [Fall 2015] COM482: Interpersonal Media: Online Communities — A course on online communities and computer mediated communication taught by Benjamin Mako Hill. 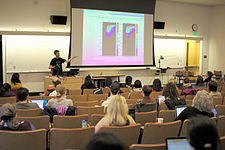 [Spring 2015] COM597: Programming and Data Science for Social Media — A quarter-long course taughted by Benjamin Mako Hill that adapts and builds upon the CDSW curriculum to teach introductory programming and data science to absolute beginners in the context of the University of Washington's Communication Leadership program. [Spring 2019] MTS525: Statistics and Statistical Programming — A quarter-long quantitative methods course that builds a first-quarter introduction to quantitative methodology and that focuses on both the more mathematical elements of statistics as well as the nuts-and-bolts of statistical programming in the GNU R programming language. Taught by Aaron Shaw. [Spring 2019] The Practice of Scholarship (MTS 503, Spring 2019) — The second of two required seminars in the Media, Technology & Society (MTS) and Technology and Social Behavior (TSB) programs, the goal for this course is simple: submit a piece of academic research for publication by the end of the quarter. The course and assignments are structured to help students cultivate (more of) the skills, wisdom, and experience necessary to publish independent, original, and high-quality scholarship in relevant venues for their work. The experience will probably feel like a combination of a writing bootcamp and an extended group therapy session. Online Communities & Crowds (COMMST 378, Fall 2016) — This advanced undergraduate course presents an interdisciplinary introduction to the study of online communities and crowds, with a particular emphasis on how and why some of these systems are so wildly effective at mobilizing and organizing people in ways that seem to have been impossible a few decades ago. Introduction to Graduate Research (MTS 501, Fall 2016) — The first of two required seminars in the Media, Technology & Society (MTS) and Technology and Social Behavior (TSB) programs, this course introduces first year Ph.D. students to research skills and gives guidance on how to be a productive and responsible scholar. Bring Your Own Research Workshop (BYOR) — A research workshop for CDSC affiliates and fellow travelers at Northwestern convened by Aaron Shaw. Participants present work and provide peer feedback/accountability in weekly meetings. Most members of the group are affiliates of the Media, Technology & Society and Technology & Social Behavior programs at Northwestern and study online communities, collective action, organizations, collaboration, and related topics. The Practice of Scholarship (MTS 503, Spring 2016) — The second of two required seminars in the Media, Technology & Society (MTS) and Technology and Social Behavior (TSB) programs, the goal for this course is simple: submit a piece of academic research for publication by the end of the quarter. The course and assignments are structured to help students cultivate (more of) the skills, wisdom, and experience necessary to publish independent, original, and high-quality scholarship in relevant venues for their work. The experience will probably feel like a combination of a writing bootcamp and an extended group therapy session.